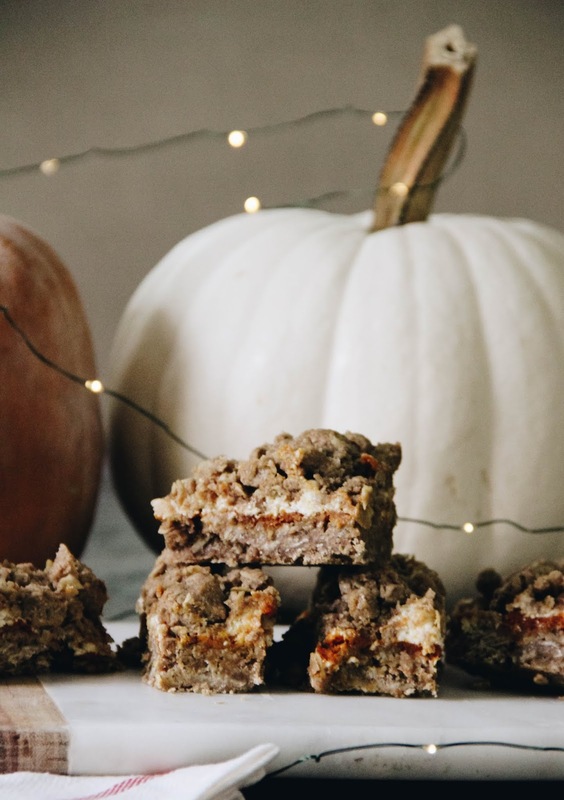 Fall desserts are probably my favorites of all the desserts. Maybe it's because of the coziness that is baking in the kitchen on a fall day, windows open and a chilly breeze wafting through, the aroma of pumpkin and spices floating around. Or maybe it's the use of crumble on top of all the things. Either way, I love some fall baking. And the other night, after dinner and while husband was putting baby sister to sleep, Greer and I got a little one-on-one time in the kitchen. 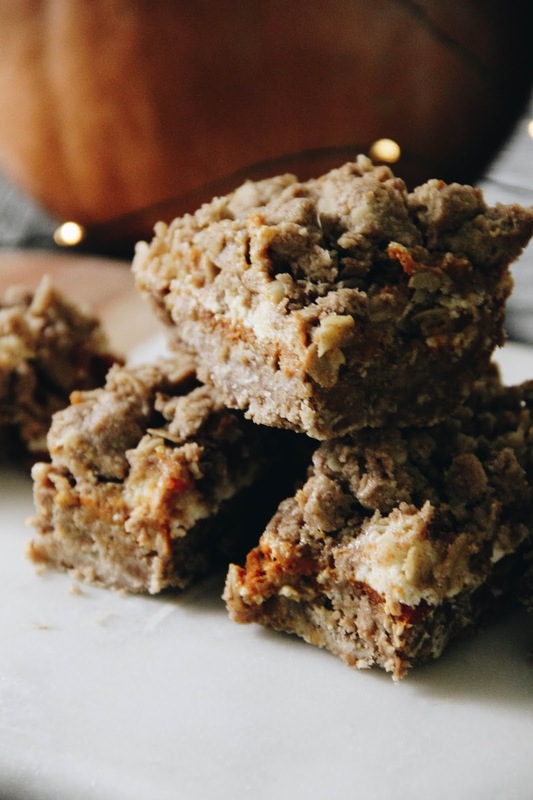 Greer and I adapted this recipe for pumpkin crumb bars and then made our own twist by adding a layer of cream cheese. Crumble topping + cream cheese. Amen. We saved a third of the dish for us an sent the other two-thirds with husband the next day to share at work. Because we're all about sharing the fall cheer! 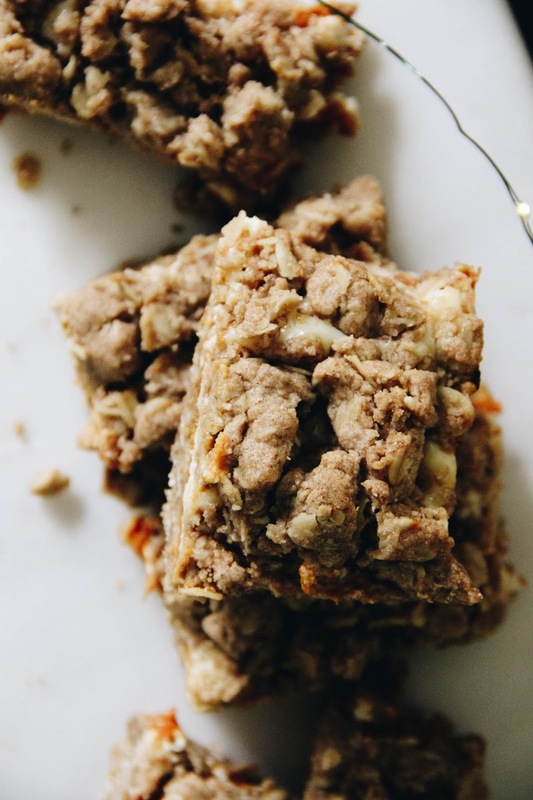 Combine the melted butter, spice cake mix (both boxes), and oats. Mix until well combined. Spread out half of the mixture into a greased 13x9 dish. Pat it down to make a solid crust. Spread the pumpkin purée evenly across the crust. Set the dish aside. In a separate bowl, whip the softened cream cheese, sugar, vanilla extract, and egg. Spread this mixture evenly on top of the pumpkin purée layer. Last step, make large balls out of the remaining crust mixture, and from that pinch off chunks and cover the cream cheese layer. Once the cream cheese layer is completely covered, gently press down on the crumble. Bake for 35 minutes. Once out of the oven, let cool for 15 before serving or let cool completely then store in the fridge and serve chilled later.